Hrithik Roshan (born 10 January 1974) is an Indian actor who appears in Bollywood films. He has portrayed a variety of characters and is known for his dancing skills. One of the highest-paid actors in India, he has won many awards, including six Filmfares, four for Best Actor and one each for Best Debut and Best Actor (Critics). 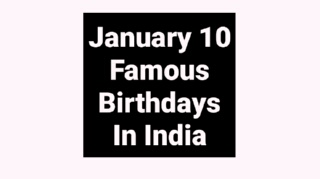 Starting in 2012, he appeared in Forbes India'sCelebrity 100 based on his income and popularity. Drashti Dhami (born January 10, 1985) is an Indian television actress and model. She came into limelight with her bubbly character of Dr. Muskaan Chadda from show Dill Mill Gayye and of Geet in the show Geet - Hui Sabse Parayi. Drashti Dhami has done many advertisements and was known for her modelling before she forayed into the TV industry. Kattassery Joseph Yesudas (born 10 January 1940) is an Indian classical musician and playback singer. Yesudas sings Indian classical, devotional, and popular music. He has recorded more than 50,000 songs in many languages including Malayalam, Tamil, Hindi, Kannada, Telugu, Bengali, Gujarati, Oriya, Marathi, Punjabi, Sanskrit, Tulu, Malay, Russian, Arabic, Latin and English. Gurinder Chadha (born 10 January 1960), OBE, is a British film director of Indian origin. Most of her films explore the lives of Indians living in the United Kingdom. She is best known for the hit films Bhaji on the Beach (1993), Bend It Like Beckham (2002), Bride and Prejudice (2004) and Angus, Thongs and Perfect Snogging (2008). Allu Aravind (born 10 January 1949) is an Indian film producer and distributor in Tollywood and political candidate. He produces films under his production company Geetha Arts with his brother in law, Chiranjeevi. He is an active member in the Prajarajyam Party founded by Chiranjeevi Konidala, he resigned as general secretary of PRP. Basu Chatterjee (born 10 January 1930) is an Indian film director. His films are very similar to those of Hrishikesh Mukherjee. Like Mukherjee, he built his plots on middle-class lives. He was born in Ajmer, Rajasthan, India. Some of his best films are Rajnigandha (1974), Dillagi, Chitchor, Choti Si Baat, Khatta Meetha, Ek Ruka Hua Faisla. Fali Sam Nariman (born 10 January 1929) is a distinguished Indian Constitutional jurist, and senior advocate to the Supreme Court of India since 1971 and has remained the President of the Bar Association of India since 1991. Nariman is an internationally recognized authority on international arbitration. He is one of India's most distinguished constitutional lawyers. John Mathai (10 January 1886–1959) was an economist who served as India's first Railway Minister and subsequently as India's Finance Minister, taking office shortly after the presentation of India's first Budget, in 1948. Mathai graduated in economics from Madras Christian College. He served as a part-time professor in University of Madras from 1922 to 1925. Suchitra Bhattacharya was born on 10 January 1950 in Bhagalpur, Bihar. She was interested in writing from her childhood. Bhattacharya graduated from the Jogamaya Devi College, an affiliated undergraduate women's college of the historic University of Calcutta, in Kolkata. Murali Nair (born 10 January 1966) is an Indian film director and screenwriter. He has directed eight films since 1993. His film Marana Simhasanam was screened in the Un Certain Regard section at the 1999 Cannes Film Festival. Jagdeep Singh (born January 10, 1993 in India) is an Indian Careeral basketball player. He plays for the Young Cagers who compete at the FIBA Asia Champions Cup and is a member of the India national basketball team. Singh competed for the India national basketball team at both the FIBA Asia Championship 2007 and FIBA Asia Championship 2009. Pingali Lakshmikantam (10 January 1894 in Arthamuru, West Godavari district, British India – 1972) was an Indian poet and writer. Lakshmikantam was born into a Brahmin in Arthamuru, West Godavari district, British India. His father was Venkataratnamu, his mother was Kutumbamma. Ancestors of Pingali family were Tikkana and Pingali Suranna. He studied up to fifth grade in Guduru. Reisangmei Vashum is an Indian football player who plays in Forward position for I-League team Kingfisher East Bengal F.C. this season. Last season he had played for Churchill Brothers. Vashum made his senior international debut against Oman.